A sport boat with good performance, which provides a smooth ride in all water conditions and doesn’t break the bank, is not as common as you might think. But the Rinker Captiva 196 BR is certainly a top contender. Rinker prides itself on offering good boats at great prices, but there’s no sacrifice in fit, finish or materials on the 196BR. The gelcoat work is fine and the upholstery is plush and comfortable with sculpted features. 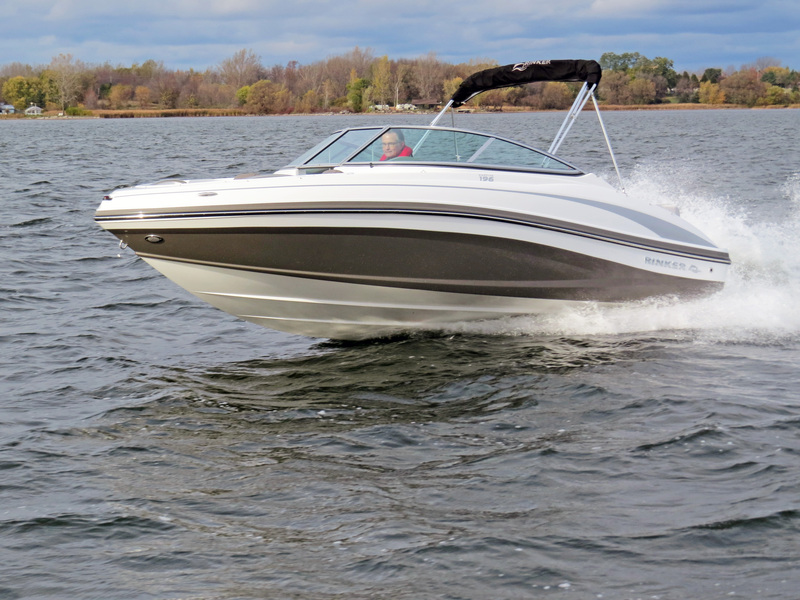 Part of Rinker’s 18- to 30-foot sport boat series, the 19-foot, 6-inch test boat has an optional dark platinum hull and sweeping sheerline that give it a classic look. The familiar bowrider layout means the boat can handle family and friends on summer days and provide secure comfortable cockpit seating in cooler, windier weather. Test day was cool and wavy, providing a good workout. Performance in any conditions calls for a muscular engine, and the test boat’s fuel-injected, 220-horsepower, 4.3-litre MPI V-6 MerCruiser sterndrive fits the bill. It pushed the boat on plane easily, reaching 20 mph in just over four seconds and 30 mph in about seven seconds. That will also translate into good acceleration and towing capacity for watersports. If you’re in a hurry, no problem, with top speed in GPS testing reaching 48.8 mph at 4750 rpm. More leisurely and economical speeds like 23 mph at 3000 rpm or 38.5 mph at 4000 rpm are ideal for everyday cruising. The modified-V hull with well-placed strakes can take credit for acceleration and speed, as well as positive handling in corners. Everybody likes to go boating on calm sunny days, but test day served up ideal conditions for testing out the 196 BR’s performance in choppy water. Even in wavy conditions, the boat turned well with moderate trim and ran comfortably despite the steep waves. Naturally performance is important, but what about storage, equipment and layout? The 196BR has standard conveniences like pop-up cleats, plenty of stainless steel grab-handles, plus speakers and drink holders. The tilt steering wheel, depth sounder, snap-in carpet and Bimini on the test boat are all part of the optional Deluxe Sports Package. The swim platform offers easy entry onto the boat and into the water, with a telescoping swim ladder that is recessed and covered. Heading forward, a hinged section of the sun lounge lifts up to expose a walkway. Beneath it, there’s a huge locker extending belowdecks, ideal for tow ropes, lines and fenders. The 196’s main cockpit has eight feet of beam, a bench seat aft, and swivelling seats at the companion and helm positions. The wide aft seat has a walkway to starboard and storage below. In the middle, a portable cooler is ready for lunch and beverages. To port, there’s another locker under the bench seat and a trash receptacle beneath the engine hatch. The huge in-floor cockpit locker has a keyhole shape for easy access. Both the companion and helm seats are comfortable and stylish, with seat bolster bottoms adjusting easily for more height. At the helm, controls and switches are easy to reach. Forward, the bow area has more storage to port and to starboard in lockers under seats. It features lounge-style seating and plenty of room to move around. The 41-gallon fuel tank delivers good range. With a 19-and-a-half foot hull that handles wind and waves easily, a spacious walk-through layout and a price well under $40,000, the numbers all add up to make the Rinker Captiva 196 a winner. This boat is featured in the Summer 2014 issue of Boats&Places.